Jacobs and Co. Steakhouse | I'm hungry, let's get some food! While my parents were in town, I found our discussion frequently turned to food. We got into a discussion about steak and I told them about my failed attempts during the summer BBQ season. I asked my father if he was just born with the innate ability to cook steak. My mother laughed and said it took him years of reading through books for marinades and techniques, watching shows on TV and simple trial and error. I remember watching him cook steak the last time I was home. He can honestly just look at a steak on the grill and know if it is ready. Needless to say, being born and raised in Alberta and having experienced my father’s professional level BBQ-ing, our family holds a pretty high standard when it comes to steak. 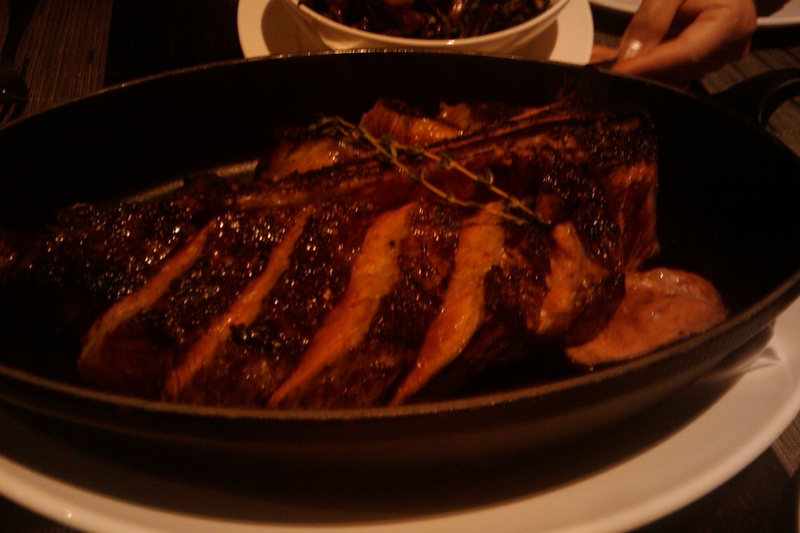 Last week we decided to try Jacobs and Co. Steakhouse. The outside is deceiving since it kind of looks like a small warehouse (until you walk to the back entrance and see the nice entranceway). Upon entering the restaurant you get interesting feel of the old being combined with the new. It doesn’t have a traditional steakhouse look which I have found have an upscale wood lodge type of feel – warm, comforting and old school classy. The lounge in the front has some trendier low and high tables situated in a room with dim lighting and a grand piano in the corner. The front end staff is very friendly as we are shown to our table. The dining room on the upper floor is well lit compared to the lounge. The dark wooden tables with bright white table cloths and the beige color of the bench seats in the booths give a contrast that feels both new age classy and old school comfort at the same time. You can’t help but notice the large glass enclosed room to the left of the stairwell where large slabs of meat are being aged to the chef’s specifications. My mother began perusing the wine list and asked our waiter about a few bottles. He seemed vaguely familiar with a few of the bottles but decided to bring over the sommelier to give us more details on the wine list. My parents gave some general specifications and the sommelier returned with three bottles. All of them sounded amazing but we decided on a Californian wine where the grapes were imported from Italy. Like the restaurant itself, the wine was a mix of the old robust, full bodied European taste with the fruitiness you find in the new world wines. I normally don’t comment on bread since in most cases there is nothing to comment on. Most places serve fresh, good tasting bread with decent butter. This place however added a bit of a twist. 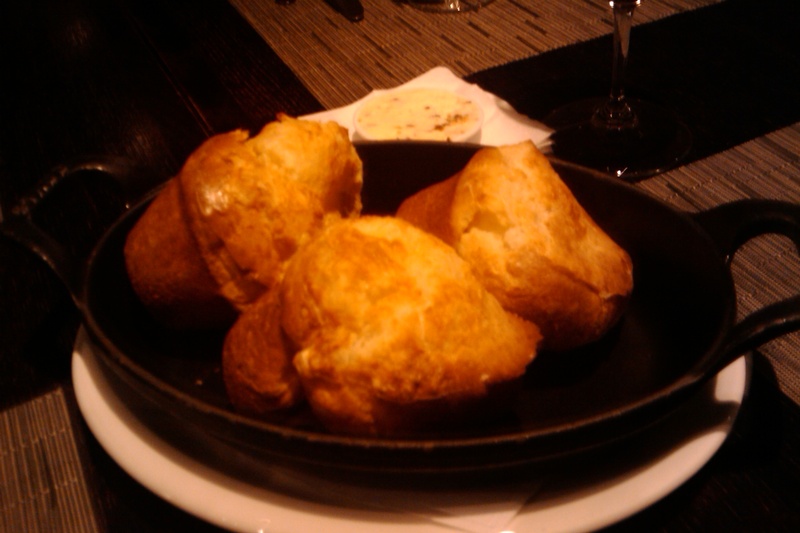 The waiter brought out three pieces of bread that looked like Yorkshire pudding. The inside contained a web of soft, delicious bread and wait for…there was cheddar baked into the outside crust. Mixed with the garlic butter this bread stood out amongst most breads I’ve had outside of a specialty bakery. We decided to get Caesar salads to start and also added Spanish white anchovies. A portable cart arrived and they prepared that Caesar salads right before us. It was an impressive display and as we watched him throw in each ingredient, we grew more excited. He filled the bowl with a few spices and threw the anchovies in, grinding them with a fork inside the giant wooden bowl. Next he threw in a mix of oils, an egg yolk, Tabasco, Worcestershire sauce and some other liquid that none of us could identify. Then he threw in the fresh, crisp lettuce and tossed the mixture around until all the pieces were lightly dressed. 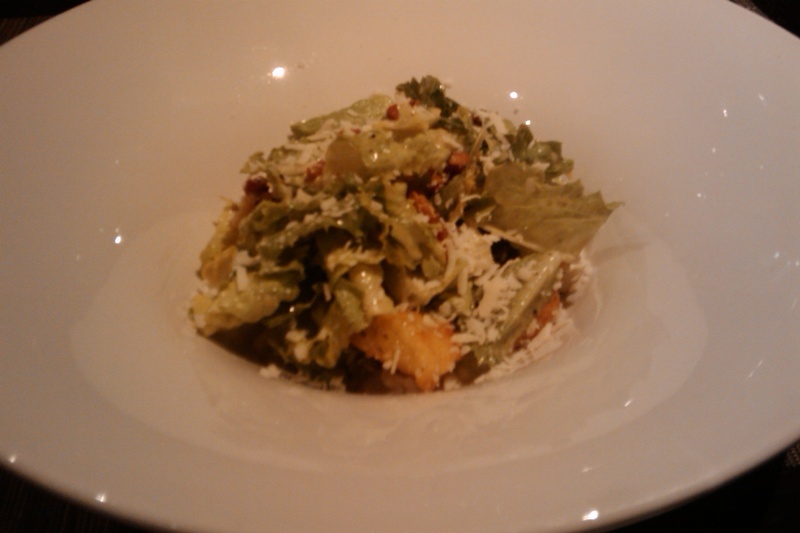 Then the salad was topped with cheese and the thick pieces of salty bacon. The salad was incredible. My father left saying that it was the BEST Caesar salad he has ever had. I had to agree. Some Caesars are too creamy, some are bland, some skimp on the bacon and cheese, some lack fresh lettuce…this was not the case with this perfect salad. I know it looks really small in the picture but it was a lot bigger than it looks and we split one order between the three of us. Jacobs has an impressive selection of steaks aged from 43 to 49 days and also offering some REALLY high end options. The most expensive steak on the menu is imported from Japan’s Kobe region and runs $190 for 6oz. My parent’s encouraged me to try it but it just doesn’t seem right paying that much for a small steak. I told them Kobe beef alone was enough motivation for me to take a trip to Japan sometime in the near future and I would try it then (hopefully). Instead, we decided to split the 40oz. porterhouse, aged 49 days, between the three us. In addition to the steak we also ordered two sides, the duck fat French fried potatoes with tarragon and cracked pepper and the roasted mushrooms. The duck fat French fried potatoes have to be one of the most unique fries I have ever had. From the first bite, you can immediately taste the duck. 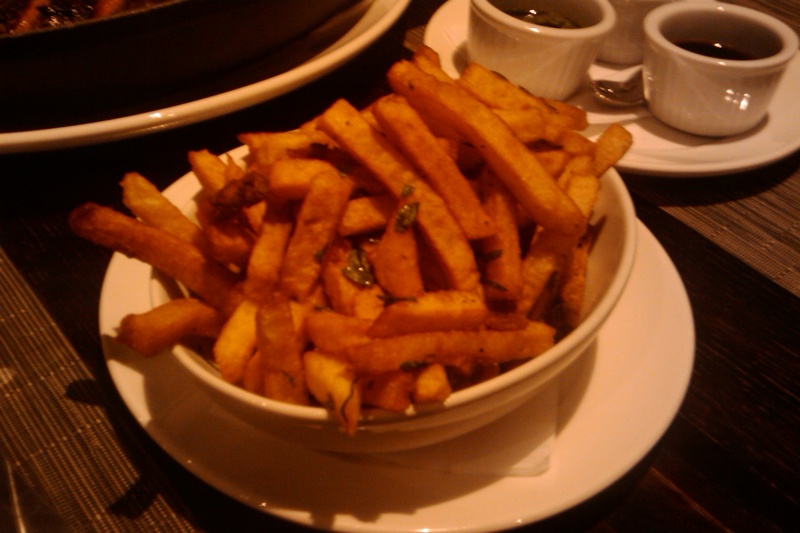 The fries themselves are crisp and nicely seasoned with pepper, tarragon and salt. I usually find tarragon to be an overpowering flavor but in this case, the duck was the dominant flavor. I like duck so generally speaking I really liked these fries but I don’t think it is something I would eat on a regular basis. The mushrooms were delicious. I find most side orders of mushrooms at steakhouses are pan-fried and too oily but this was not the case here. 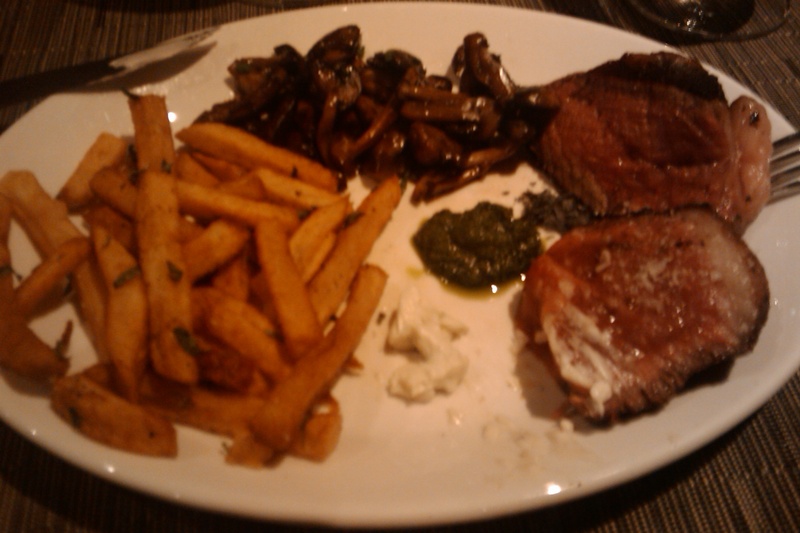 There were at least three variations of mushrooms in the mix and combined with the steak, they were delicious. 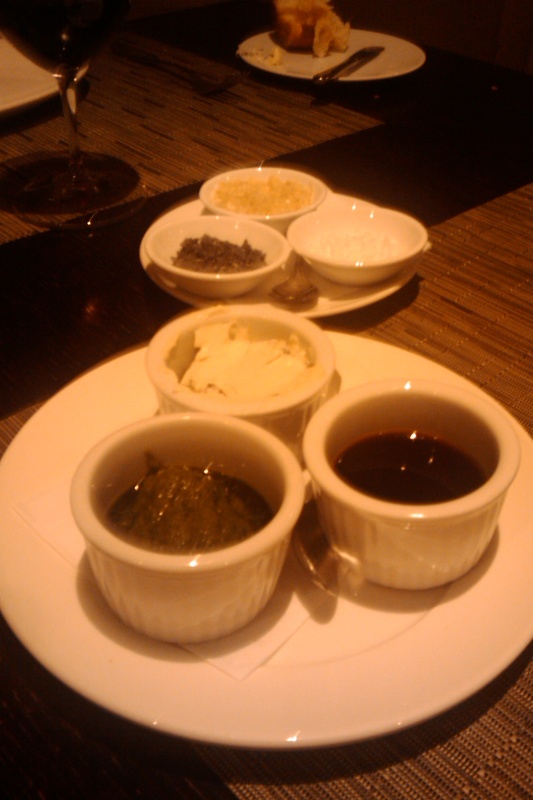 Before I get into the steak I should mention the sauces and salts they brought to accompany the steaks. I had always been under the belief that you don’t need to add any sauce or additional seasoning to a good steak so I was surprised when I saw these brought out. Three sauces were brought out, a Japanese ponzu sauce (basically sweet soy sauce with ginger), a chimi churi which looked like green pesto with a basil/light chili taste and a blue cheese sauce with double smoked bacon. There were also three types of sea salt, a regular plain sea salt, a smoky sea salt and a dark mineral sea salt. We ordered a medium rare steak and that is exactly how it came out. Our family has a bit of a pet peeve about overcooked steak. The steak was really thick with a bright red center. It came pre-sliced off the bone which saved us the trouble of having to cut up the pieces ourselves. In terms of taste, the steak was great. The steak lacked seasoning and spice taste but had a solid beefy taste. The steak was well marbled and very tender. Adding the sea salt really brought out the flavor and the sauces were a nice addition to the flavor of the meat. How does that steak compare to the other high end steak houses in Toronto is a question I’m sure to get. Hy’s produced a solid steak with a lot of flavor but I found it was a little overcooked. Ruth Chris had the fattiest steak which had a lot of flavor but ended up doing a number on my stomach due to the high fat content. Barbarian’s was good but kind of unmemorable. I remember the classic steak house ambiance but very little about the steak itself. I would put Jacob’s steak above these three places but in terms of taste I would have to say that my favorite is still Harbor 60. For dessert we had the apple crumble. The apple slices were nicely seasoned with cinnamon and brown sugar but neither flavor was overpowering. The crumble was delicious and lightly toasted to give it a real crunch. 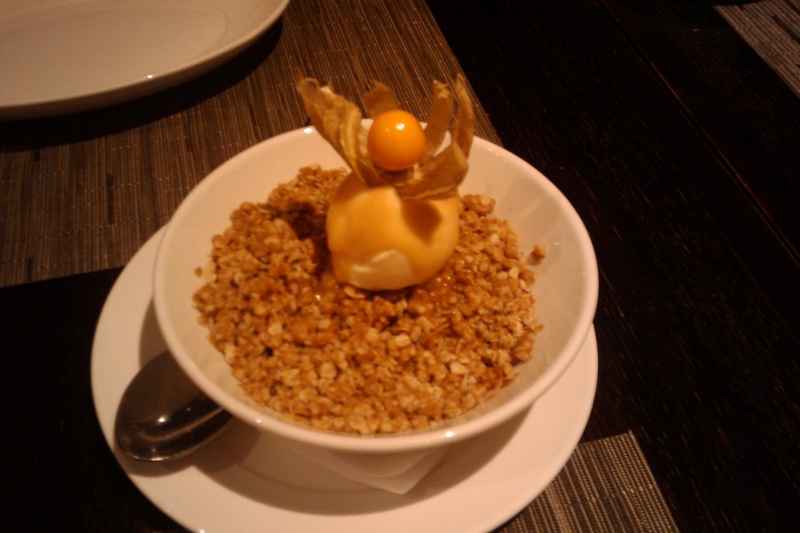 The ice cream on top was refreshing and worked wonderfully with the warm dessert below it. 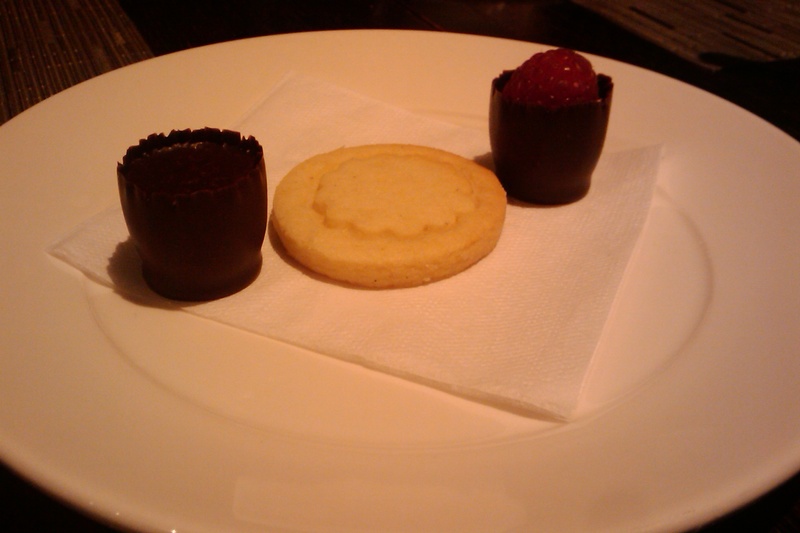 In addition to the dessert, they also brought another plate of sweets with a couple pieces of rich dark chocolate and a ginger sugar cookie. When the bill arrived, the staff also sent us off with three muffins. This would be breakfast for my parents in the coming days. Jacobs and Co serves up a tasty steak with delicious sides. For a pan seared steak that is then put in a 1800 degree oven (and not BBQ-ed) it is pretty damn good. I think this place has also ruined me for Caesar salads… I’m not sure if I’ll have any better and it will haunt my dreams… and yes, I often dream about food. ~ by jlowjlow on November 26, 2009. This entry was posted on November 26, 2009 at 10:52 pm and is filed under Fine Dining, Steak, Toronto.You can follow any responses to this entry through the RSS 2.0 feed.You can leave a response, or trackback from your own site.